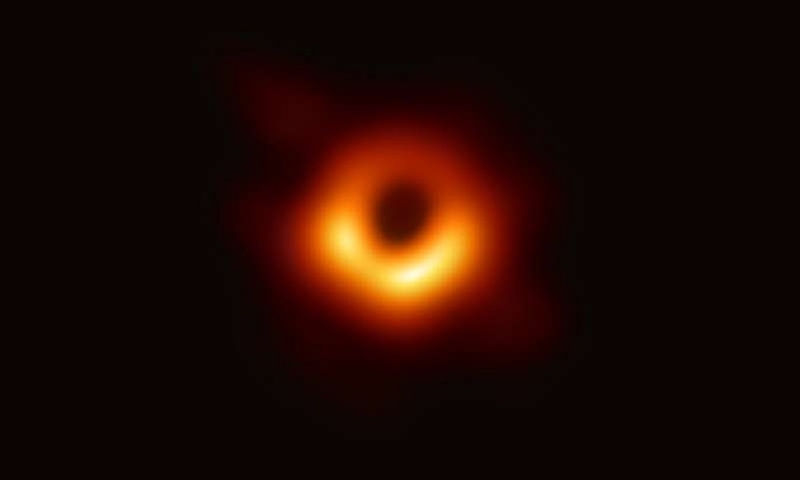 A handout photo provided by the European Southern Observatory on Wednesday shows the first photograph of a black hole and its fiery halo, released by Event Horizon Telescope astronomers (EHT). The supermassive black hole is 50 million lightyears away in a galaxy known as M87. ASTRONOMERS on Wednesday unveiled the first photo of a black hole, one of the star-devouring monsters scattered throughout the Universe and obscured by impenetrable shields of gravity. The image of a dark core encircled by a flame-orange halo of white-hot gas and plasma looks like any number of artists’ renderings over the last 30 years. But this time, it’s the real deal. Scientists have been puzzling over invisible “dark stars” since the 18th century, but never has one been spied by a telescope, much less photographed. The supermassive black hole now immortalised by a far-flung network of radio telescopes is 50 million lightyears away in a galaxy known as M87. “It’s a distance that we could have barely imagined,” Frederic Gueth, an astronomer at France’s National Centre for Scientific Research (CNRS) and co-author of studies detailing the findings, told AFP. Most speculation had centred on the other candidate targeted by the Event Horizon Telescope -- Sagittarius A*, the black hole at the centre of our own galaxy, the Milky Way. By comparison, Sag A* is only 26,000 lightyears from Earth. Locking down an image of M87’s supermassive black hole at such distance is comparable to photographing a pebble on the Moon. European Space Agency astrophysicist Paul McNamara called it an “outstanding technical achievement”. It was also a team effort. “Instead of constructing a giant telescope that would collapse under its own weight, we combined many observatories,” Michael Bremer, an astronomer at the Institute for Millimetric Radio Astronomy (IRAM) in Grenoble, told AFP. Over several days in April 2017, eight radio telescopes in Hawaii, Arizona, Spain, Mexico, Chile, and the South Pole zeroed in on Sag A* and M87. Knit together “like fragments of a giant mirror,” in Bremer’s words, they formed a virtual observatory some 12,000 kilometres across -- roughly the diameter of Earth. In the end, M87 was more photogenic. Like a fidgety child, Sag A* was too “active” to capture a clear picture, the researchers said. “The telescope is not looking at the black hole per se, but the material it has captured,” a luminous disk of white-hot gas and plasma known as an accretion disk, said McNamara, who was not part of the team. “The light from behind the black hole gets bent like a lens.” The unprecedented image -- so often imagined in science and science fiction --- has been analysed in six studies co-authored by 200 experts from 60-odd institutions and published Wednesday in Astrophysical Journal Letters. “I never thought that I would see a real one in my lifetime,” said CNRS astrophysicist Jean-Pierre Luminet, author in 1979 of the first digital simulation of a black hole. Coined in the mid-60s by American physicist John Archibald Wheeler, the term “black hole” refers to a point in space where matter is so compressed as to create a gravity field from which even light cannot escape. The more mass, the bigger the hole. At the same scale of compression, Earth would fit inside a thimble. The Sun would measure a mere six kilometres edge-to-edge. A successful outcome depended in part on the vagaries of weather during the April 2017 observation period. “For everything to work, we needed to have clear visibility at every (telescope) location worldwide”, said IRAM scientist Pablo Torne, recalling collective tension, fatigue and, finally, relief. Torne was at the controls of the Pico Veleta telescope in Spain’s Sierra Madre mountains. After that, is was eight months of nail-biting while scientists at MIT Haystack Observatory in Massachusetts and the Max Planck Institute for Radio Astronomy in Bonn crunched the data. The Universe is filled with electromagnetic “noise”, and there was no guarantee M87’s faint signals could be extracted from a mountain of data so voluminous it could not be delivered via the Internet. There was at least one glitch. “We were desperately waiting for the data from the South Pole Telescope, which -- due to extreme weather conditions during the southern hemisphere winter -- didn’t arrive until six months later,” recalled Helger Rottmann from the Max Planck Institute. It arrived, to be precise, on December 23, 2017. “When, a few hours later, we saw that everything was there, it was one hell of a Christmas present,” Rottmann said. It would take another year, however, to piece together the data into an image. “To be absolutely sure, we did the work four times with four different teams,” said Gueth. Each team came up with exactly the same spectacular, history-making picture of a dark circle encased in a flaming-red halo.